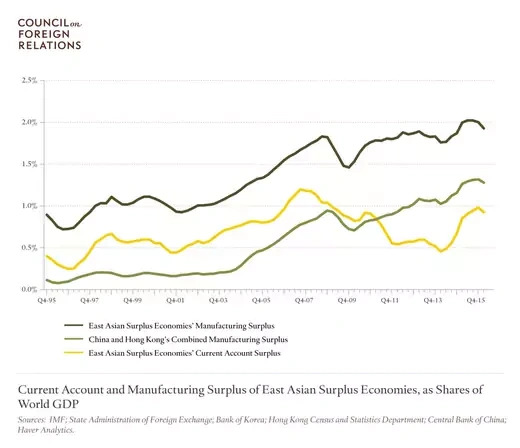 The combined savings of China, Japan, Korea, Taiwan, and the two city-states of Hong Kong and Singapore is about 40 percent of their collective GDP, a thirty-five-year high. 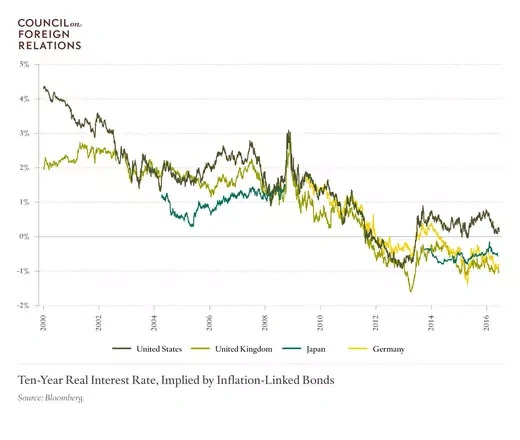 No other region of the world currently contributes more to the global glut in savings that has brought interest rates around the world down to record lows. 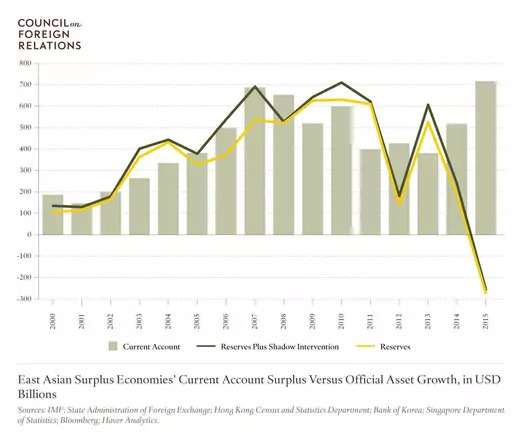 Asia’s current account surplus—its excess of savings over investment—has increased significantly in the past two years and is now about as large, relative to the GDP of its trading partners, as it was prior to the global financial crisis. 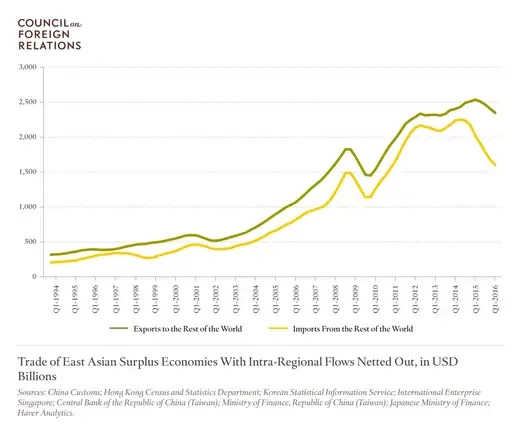 Without a policy push to bring down savings, East Asia’s excess savings will continue to give rise to new economic and financial risks, both inside the region and globally. 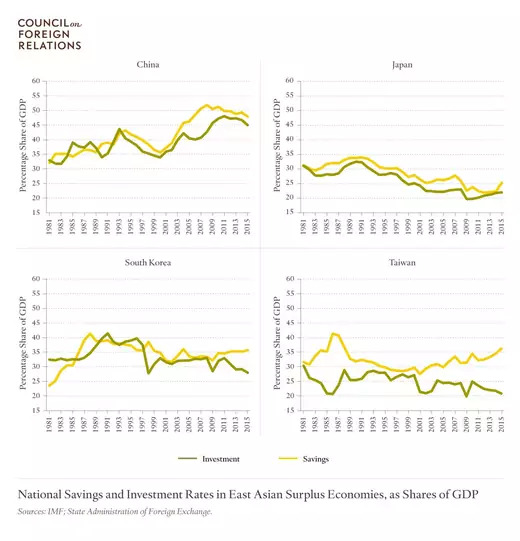 Before the financial crisis, excess East Asian savings stoked the U.S. housing bubble and helped to create internal imbalances in the United States and the eurozone, which were sustained only through the accumulation of toxic risks in the U.S. and European banking systems. Since the crisis, the savings have contributed to bubbles and bad debts within the region, notably in China. 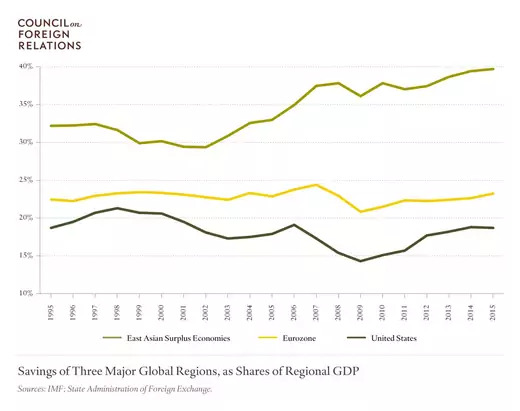 Throughout, the need to rely on exports to offset the weakness in demand that often comes with high savings has put pressure on trade-exposed manufacturing communities in other regions, with political consequences that had been underappreciated until recently. 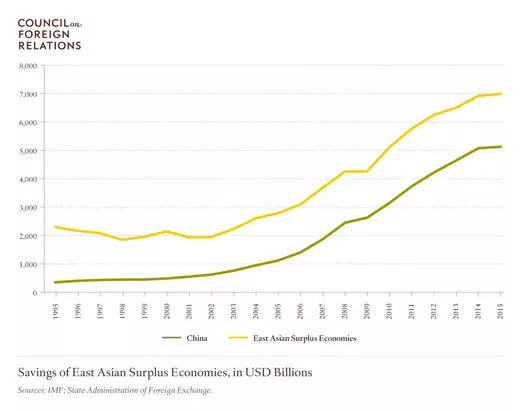 East Asia’s surplus is all the more remarkable because it has reemerged despite two factors that act to reduce it. 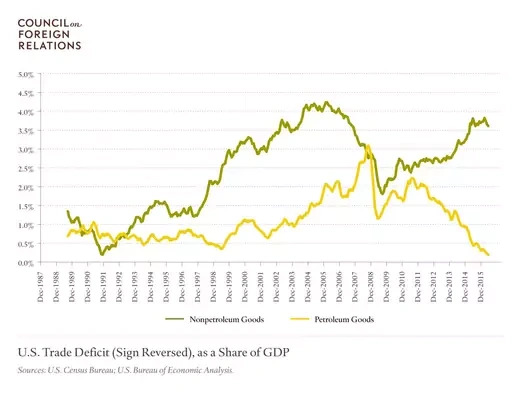 China’s investment remains at historically high levels and Japan’s budget deficit is around 5 percent of its GDP. Both high investment and large fiscal deficits usually absorb significant amounts of savings at home. 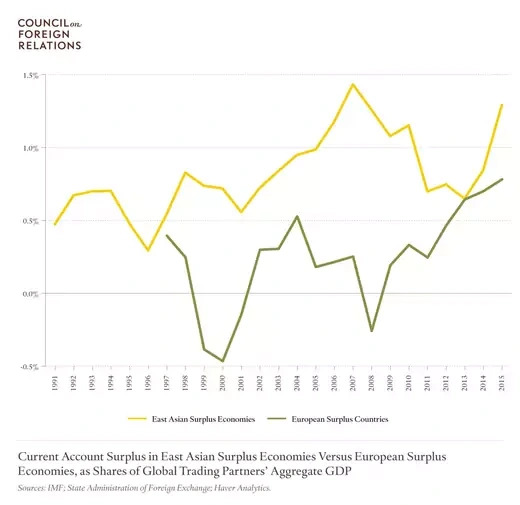 These two surplus-reducing factors are overwhelmed, however, by East Asia’s extremely high rate of saving. To control its bad-debt problem, China may reduce credit creation and investment. To control its government-debt problem, Japan may opt for fiscal consolidation. In either case, policies that reduce domestic risks could give rise to new global risks. 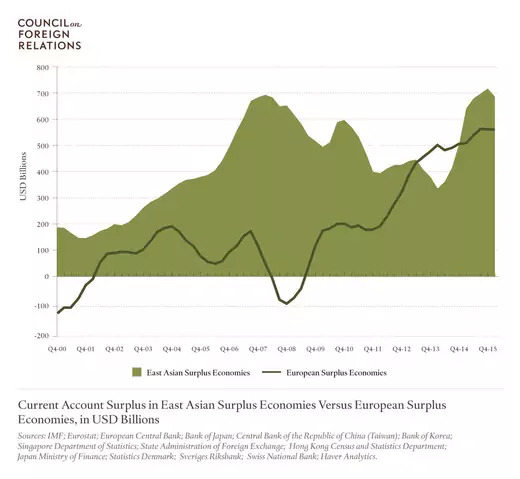 East Asia’s external surpluses are no longer maintained primarily through intervention in the foreign exchange market, with the result that moving toward floating currencies is no longer a sufficient policy response to the region’s trade surplus. 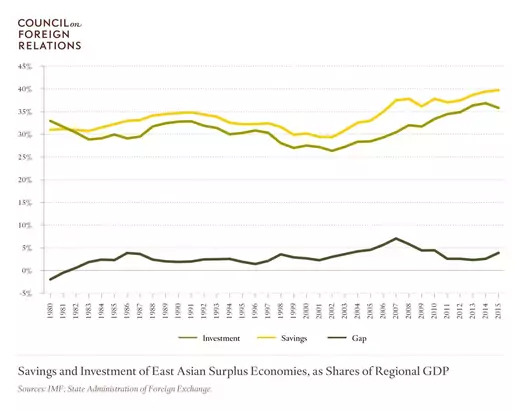 The traditional U.S. economic agenda in East Asia—aimed at liberalizing trade, investment, and exchange rates—needs to be complemented with a push for the policies needed to bring East Asia’s savings down to a level that the region can more easily absorb internally. The adjustment should be centered on China, where exceptionally high levels of savings no longer serve the same purpose as during the country’s catch-up phase of economic development. A national savings rate that still approaches 50 percent of output increasingly implies either bubbles in credit domestically or large capital surpluses that have to be exported. Korea and Taiwan also have scope to reduce high levels of national savings by expanding their social safety nets and reducing government savings, and Japan can take steps to reduce its high level of corporate savings. Is South Korea Pro-China and Anti-Japan? It’s Complicated.